Our focus at ImpactECON is economic modeling which provides insight. Our team have been providing economic modeling services for over 20 years. The core of our approach utilizes Computable General Equilibrium (CGE) models. CGE models recognize that a price change in one market can lead to impacts and price changes in other markets; providing a comprehensive picture of the economy-wide linkages essential to sound recommendations. investigation of the employment effects and changes in labor force composition and wages and how these impact households. Recently, our staff developed a global model and database that can be used to investigate the impact of economic policies and environmental factors on global supply chains. By differentiating between imported intermediates and imported final goods this essentially creates different commodities that are subject to distinct trade restrictions and policies, that can also be investigated using these tools. 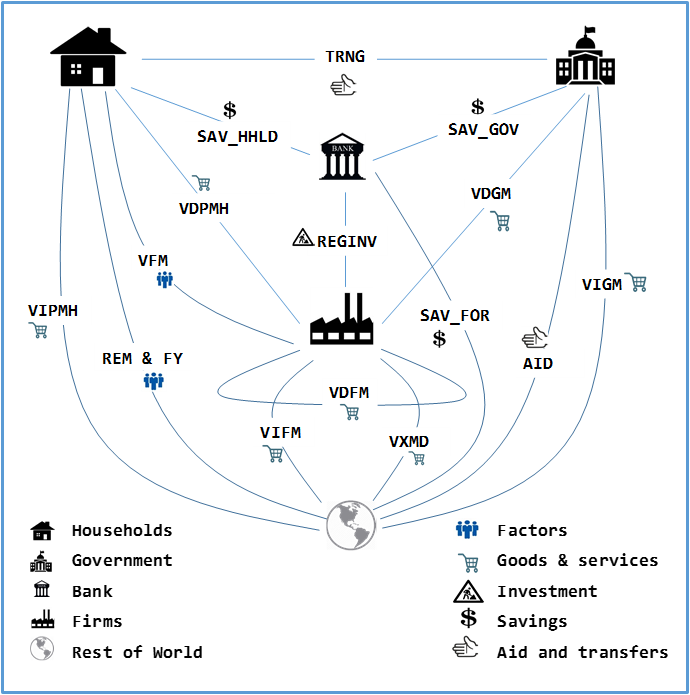 The MyGTAP model, also developed by staff at ImpactECON, allows users to undertake country-specific analysis examing the impact of policies on multiple households and factors of production, while maintaining the global linkages found in the standard GTAP model. 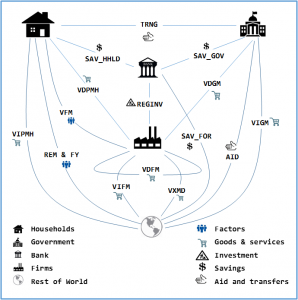 This model also enhances analysis of government behavior and foreign income flows, such as foreign aid. In cases where policy implementation and impacts are spread over a longer time span, or where the impacts of dynamic growth are important, we employ dynamic CGE models such as the Dynamic GTAP Model (GDyn) or ImpactECON’s dynamic supply chain model (IESCDyn). The staff at ImpactECON also have experience with numerous other GTAP models including Migration models (GMig2 and GMig2Dyn), the GTAP PE-GE model, and the energy model (GTAP-E), as well as a number of GAMs-based models including the GLOBE model, the OECD METRO model and the World Bank’s R23 model. ImpactECON maintains the software required for source code development, which means we can create unique models and analysis and distribute these materials with minimal client license requirements. This capability also increases the distribution potential within your organization of the model and code we create for you, adding value to your investment in a customized product. Whether you require customized model coding, ‘what-if’ scenario development, impact analysis, or data for input into your own analysis, ImpactECON can help you meet your goals.